Cognitive behavioral therapy, commonly referred to as CBT, is the core treatment modality provided at Sprout Health Group. The treatment focuses on challenging unhealthy thoughts or behaviors with coping strategies that help clients manage stress and emotionally triggering situations. Its effectiveness has made it of the most common approaches to treating drug addiction and co-current disorders. Originally developed to treat depression, cognitive behavioral therapy gives clients practical tools to manage anxiety and stress. This has made it an especially helpful aspect of treating clients with a dual diagnosis. Clients have also found CBT beneficial in conjunction with other forms of therapy. Treatment may also include medication as prescribed, experiential therapy, family therapy and other holistic treatments. A relatively new form of psychotherapy, CBT evolved from the development of behavior therapy in the 1920s. At the time, the idea that false, negative beliefs led to emotional stress was groundbreaking. Today, therapists use CBT to treat depression, anxiety, PTSD and addictive behaviors. The approach is founded on the idea that cognitive distortions, or exaggerated and irrational thought patterns, lead to emotional distress and anxiety. CBT therapy seeks to help clients challenge these negative thoughts. Clients learn to recognize harmful self-talk and develop coping mechanisms that help them develop a more rational, positive mindset. There are many benefits of cognitive behavioral therapy in substance abuse treatment. 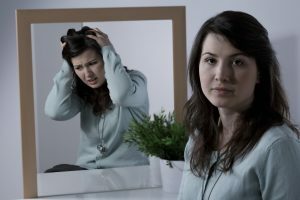 Individuals with addiction often struggle with disordered thinking and negative self-talk that can lead to harmful behaviors. CBT helps to challenge those thoughts and develop healthier ways to view triggering situations. Because the approach is direct and goal-oriented, individuals in recovery stay motivated to continue in treatment. Strategies focus on actions that clients can take today, rather than dwelling on the past. Many clients also find the coping mechanisms helpful for managing everyday stress, which can make their recovery more permanent. In this introductory phase, the therapist will explain how CBT works and work with you to identify your goals. There’s no need to start a session with goals in mind. This is all part of the process. Your therapist will help you determine specific thoughts or behaviors that you can work on changing. Once you become familiar with the process and set goals with your therapist, you will start learning how to recognize when you experience unhealthy thoughts or emotions. During this phase, you will also learn to determine whether your negative self-talk is grounded in reality, or if you are being unnecessarily hard on yourself. Often times, self-harming spirals start with thoughts that simply are not true. In the third phase of CBT, your therapist will help you develop personal coping mechanisms to identify and manage negative thoughts and cognitive distortions. Coping mechanisms might include breathing techniques, journaling, asking yourself a series or questions or playing “mental games” that help you see a situation more clearly. Since every person is different, it may take some time to learn what works best for you. Good communication with your therapist and an open mind are important. Once you have identifying coping mechanisms that work well for you, it takes practice to make them become a habit. This fourth phase of CBT focuses on applying your coping skills in everyday life and finding ways to implement them, even when you’re stressed or when conditions aren’t ideal. You can think of your final phase of CBT as “maintenance.” Because life is unpredictable, you need strategies to handle unexpected stressors. When the newness of recovery wears off and life becomes routine, how will you handle old thoughts and cognitive distortions? Follow-up appointments can help keep you on track and able to handle new stresses as your life changes. An important part of drug addiction treatment, cognitive behavioral therapy helps clients learn to recognize the everyday stressors and life situations that drive them toward addictive behavior and helps them develop healthier strategies. CBT is especially important for individuals with dual diagnoses or co-current disorders, but because most people who struggle with addiction also struggle with other stressors, all clients can benefit from the therapy. This is why we have made CBT a core pillar of treatment at Sprout. To learn more about how CBT can help you or a loved one suffering from addiction, call us today. We are here to help.